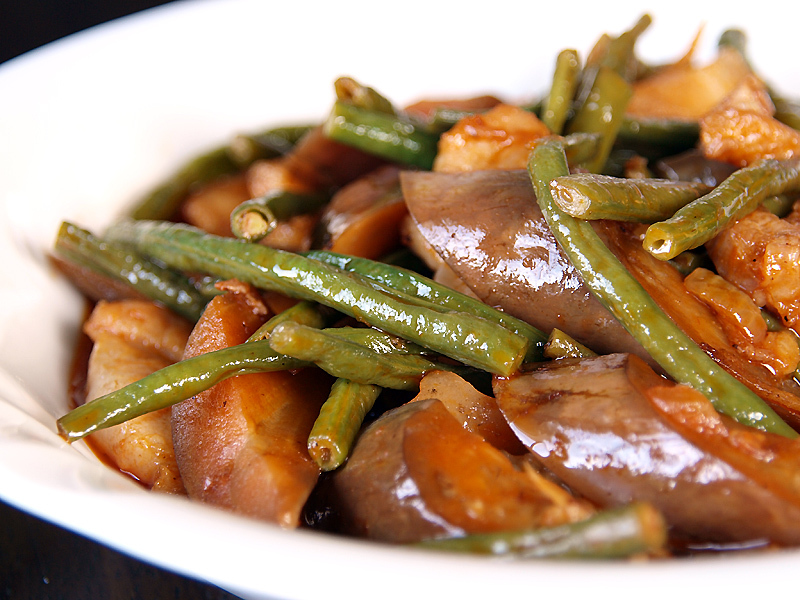 What happens if you use the vegetables in pinakbet and use the base sauce of ratatouille? It will be ratabet or pinaktouille, well not quite, I just made that up. If I name it like such it would sound funny so I will be simply calling Eggplant and String Beans in Tomato Sauce, a vegetable dish which is a cross between the two dishes that I had just mentions. I made this dish using what I have on hand which is unplanned unlike most of the dishes here, it turned out pretty well so here it is a recipe to share and for you to enjoy. In a pan add oil and sauté garlic and onion stir fry until onions turn soft. Add tomatoes then continue to stir fry for 2 minutes. Add tomato paste, water, sugar and bagoong then cover and simmer for 5-8 minutes in medium heat until vegetables are cooked. Season with pepper then serve. A very appealing and inventive fusion! I have never heard of pinakbet, thanks for the discovery! Another great way to use eggplant. The egg plant and string beans are those we adore minus the tomato sauce. This is a really yummy one for a veggie lover like me!